When you bought your home, the idea of renting just one more year probably made you want to tear your hair out. After all, when you’re renting, you’re subject to the rules and whims of the owner (according to the rental contract, of course). Want to get rid of that awful orange paint in the dining room? Not unless the landlord okays it! Unfortunately, that itch to own and get out from under your landlord’s thumb may have resulted in a less-than-favorable interest rate and a high monthly payment. If you’ve managed to build up some good equity in your home and fixed that low credit score, refinancing your FHA mortgage loan could help lower your monthly payments. But can an FHA mortgage loan be refinanced at any time? Refinancing a loan is, essentially, paying off the existing loan and replacing it with a new one. More often than not, that means there aren’t any restrictions about refinancing, at least as designated by the original loan. The easy answer is that an FHA mortgage loan (or any mortgage financing) can be refinanced whenever you choose. However, just because you can refinance at any time doesn’t mean you should. Refinancing can have major financial impact, so we suggest a bit of planning before diving straight into the refinance process. If you currently have an FHA mortgage loan, you have a couple of options. You can opt for a streamlined FHA refinance or you can opt to refinance with a conventional loan. An FHA mortgage loan refinance often gets processed more quickly, since you’re going from one FHA loan to another. 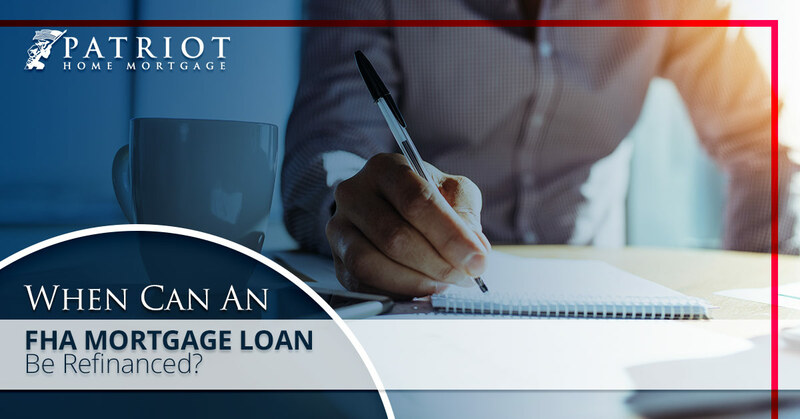 This means you can go through the refinancing process without dredging up a lot of documentation you’d traditionally need, since your current loan has that information already. However, with FHA mortgage loan refinancing specifically, you have to have had the loan for a given amount of time (which is different based on when your FHA loan was initiated). You also cannot have more than one late payment that was more than 30 days late, and that one late payment cannot have been in the last 90 days. The other big stipulation is that refinancing has to show a “net tangible benefit,” which is to say that the refinance has to improve the financial situation of the borrower. For FHA mortgage loan refinancing specifically, that means principal and interest have to be reduced by at least 5 percent of the loan’s value and/or take your loan from an adjustable rate mortgage to a fixed-rate loan. Refinancing to a conventional loan offers different benefits and drawbacks. Making the switch to a conventional loan can often offer a better interest rate, especially if you have built up enough equity in the original loan to cover 20 percent of the loan’s value or more. The flipside is that if you’re under that 20 percent threshold, you could face mortgage insurance. Conventional loans also potentially offer better interest rates, especially if your credit score is good. Since many borrowers with FHA mortgage loans had poor credit when initiating the loan, an improved credit score can have a big impact on the interest rate you’re offered. Combine that with at least 20 percent equity and conventional mortgage refinancing offers the possibility of a pretty good decrease in your monthly payments. However — and this is a big however — when you refinance with a conventional loan, you will have to pay closing costs and supply new rounds of documentation. This is a big thing to remember because, not only will you have to prove how financially stable you are with W-2s and pay stubs, you’ll also take on a bit more debt with the closing costs. Closing costs usually range between 2 and 5 percent of the cost of the loan. For example, a minimal 2 percent of a $400,000 loan is still $8,000. You may be able to roll those costs into the new loan, but you may also be responsible for paying that amount when you sign on the dotted line. Confused yet? It’s understandable, so let’s break it down to the basics. Refinancing should only be done when you’ll benefit financially. That includes both up-front and in the long-term. If you refinance to a conventional loan, but you’ll need mortgage insurance, add up what that cost will be until you hit the 78 percent threshold. That additional cost may mean it’s not worth it to refinance yet. If refinancing will reduce your monthly payments but you can’t afford the closing costs, you may be better off waiting and saving up. The same thing goes with documentation. For example, if you recently switched from a salaried position to a commission-based job, you’ll want to wait a while before refinancing since commission-based pay is valued differently. In the end, if refinancing will help you move from an adjustable-rate to a fixed-rate loan, it will lower your interest rate, and/or the closing costs are less than your net gain, refinancing makes sense. The best way to gauge that is to start with a refinancing calculator to figure out where your break-even point is. Then, contact the mortgage broker team at Patriot Home Mortgage. We work with multiple mortgage and refinancing options so we can help you determine whether now is a good time to refinance and which option to choose. Contact us today to get started!